The Dwarf Gourami is one of the smallest and most striking of the gouramis, and a showpiece for the aquarium! The Dwarf Gourami Trichogaster lalius (previously known as Colisa lalia) has long been one of the most popular aquarium fish. It is adored by aquarists for its sparkling, almost translucent blue coloring accented with fine stripes of red or dark orange. With this pretty striping, Dwarf Banded Gourami is another common name for it. There are reports of some growing up to 3 1/2 inches (8.8 cm) in length, but most males will only reach a length of about 3 inches (7.5 cm) with the females being a bit smaller. It is a very beautifully appointed fish that makes a striking display in the aquarium. This species is one of the Labyrinth fish, members of the suborder Anabantoidei also called Anabantoids. This group is distinguished from all other types of fish because they can breathe atmospheric oxygen. They can still get oxygen by passing water through their gills, but they have an additional respiratory organ called the "labyrinth organ". In nature if the water begins to dry up or becomes polluted, this organ gives them the distinct ability to breath oxygen by gulping air at the surface. Characteristic of the Labyrinth fishes, the Dwarf Gourami is a bubble nest builder. However it is unique in that it will use bits of vegetation in its nest. In nature it adds such things as leaves, twigs, roots, peat fibers, and other debris. In an aquarium you can see a cluster of bubbles on the top of the water. Once the female lays the eggs, the male will pick them up in his mouth and put them in his bubble nest and will continue to guard the eggs until they hatch. With its small size and being fairly durable, it has long been recommended as a good choice for the beginner. It is very desirable for a smaller aquarium, at least a 5 gallon tank, but a larger 10 gallon aquarium is recommended. It can be kept in a community tank and is usually peaceful with everybody, even almost shy. It is undemanding and fairly easy to breed as well. It is actually great for any level of fish keeper as long the tank is properly set-up and maintained. Being a peaceful fish makes them a good addition to a community tank but they can be a little timid, especially if housed with fish that pester them. The aquarium needs lots of plant cover not only for nest building, but also to provide plenty of places to hide. The tank location is also important as they become very nervous in areas that are loud or have a lot of traffic around the tank. Other small peaceful fish make excellent tankmates but large and/or aggressive fish do not. Fin nippers and gaudy species like guppies, as well as other anabantoids, including Bettas, should also be avoided. A male Dwarf Gourami will be aggressive towards other dwarf gouramis or similar looking fish, and may bully a female. Males are usually peaceful and non-aggressive, but when a female is introduced it will display territorial behavior, developing a deep purple chest and flare up his dorsal fin. Yet even during the courtship and after building the nest the male sometimes considers the female as a rival and may attack her. Only in larger tanks that are well set up will territorial aggression be reduced and the types of tankmates be more expansive. This species has been developed into several different types of dwarf gourami. Breeders selectively pair specimens with the most desirable characteristics, thereby strengthening those characteristics in their offspring. Today's varieties are the result of generation after generation of these improvements. Some of the most popular varieties include the Powder Blue Dwarf Gourami, the Flame Dwarf Gourami, and the Neon Blue Dwarf Gourami or Rainbow Dwarf Gourami. The Dwarf Gourami has also been crossed with the Thick-lip Gourami Trichogaster labiosus, however in these hybrids only sterile males have developed. This species has undergone a number of scientific name changes. It was originally named Trichopodus lalia in 1822 by Hamilton and Buchanan, from specimens of the Gangetic provinces of India. Then a paper by Myers in 1923, resulted in a taxonomic misinterpretation which was only recently discovered. But at that time the generic name Colisa was adopted for the western species of gourami and the generic name Trichogaster was adopted for the eastern species. Later in 1999, Menon described it under the genus Polyacanthus. Then the interpretation by Myers in 1923 came under review and the taxonomical structure revisited, and restructured. The result is that the species which had been placed under Colisa have now been reverted back to Trichogaster, and the species which had been placed under Trichogaster reverted back to Trichopodus, as per Topfer and Schindler in 2009, and Tan and Kottelat in 2009. This species is listed on the IUCN Red List as Least Concern (LC). The occurrence of this species is very wide and there are no significant threats across its range. All the fish available in the aquarium trade today are commercially produced. It is very unlikely that wild caught specimens would be encountered for the aquarium. They are found in waterways and paddy fields of the tropical Far East inhabiting slow-moving streams, rivulets, rice fields, irrigation channels and other agricultural lands. They typically occur in areas with thick vegetation such as the wetlands of the Ganges river and those of the Jumna, Bramaputra, and Baram rivers in Borneo. They are omnivorous in nature and feed on small invertebrates, algae, and other aufwuchs. The body of the Dwarf Gourami is somewhat compressed and its fins are rounded and relatively large. The ventral fins are threadlike and carry touch-sensitive cells that are extremely perceptive. This fish has a labyrinth organ, a part of the fish which allows it to absorb atmospheric oxygen directly into the bloodstream. The Dwarf Gourami male can reach about 3 inches (7.5 cm) in length, though there are reports of some growing up to 3 1/2 inches (8.8 cm). The smaller females reach around 2 1/3 inches (6 cm). They have an average lifespan of 4 years, but can live 5 to 7 years with proper care. Males are easily distinguished with an almost translucent blue to bluish green coloring with red to orangish red vertical striping extending onto the fins and a blue-green belly. When a female is present, males will develop a deep purple chest and flare up its dorsal fins in a courtship display. Females have a silvery, light gray background and are less colorful overall. This species has been developed into several different types of dwarf gourami. Breeders selectively pair specimens with the most desirable characteristics, thereby strengthening those characteristics in their offspring. Today's varieties are the result of generation after generation of these improvements. It has also been crossed with the Thick-lip Gourami Trichogaster labiosus, however in these hybrids only developed sterile males. The beautiful color morphs will emphasis the red or blue coloring and are distinguished and described by their common names. Some of the most popular varieties include the Powder Blue Dwarf Gourami which is almost entirely bright blue, the Flame Dwarf Gourami which is the reddest variety , and the Neon Blue Dwarf Gourami or Rainbow Dwarf Gourami, which has stripes bright blue and dark red. The Flame Dwarf is sometimes looks very similar to and often confused with a red variety of Honey Gourami Trichogaster chuna. Size of fish - inches: 3.5 inches (8.79 cm) - Though they can grow to 3 1/2" (8.8 cm) in length, males will normally reach about 3" (7.5 cm) and females about 2.4" (6 cm). Lifespan: 4 years - The average lifespan is 4 years, but with proper care they could live as much as 7 years. This is a hardy fish and has long been recommended as a good choice for the beginner. They are fairly undemanding as long the tank is properly set-up and maintained. They do need a strict maintenance schedule as they are prone to disease if the water quality fails. They are also great eaters and fairly easy to breed. Tank location is important too as they become nervous and are easily stressed if kept in areas that are loud, or where there's a lot of traffic around the tank. Be very careful when selecting a specimen. In recent years some available specimens have been found to carry a virus called the Dwarf Gourami Iridovirus (DGIV). Symptoms include lethargic behavior, darkening of color, and tumors, and infected fish will die within a year. Currently there is no treatment for this virus and it can be transmitted to some other fish species sharing the same water including Swordtails, Mollies, and possibly cichlids. The Dwarf Gouramis are omnivorous, in the wild they feed on small invertebrates, algae, and other aufwuchs. In the aquarium these fish will generally eat all kinds of live, fresh, and flake foods. To keep a good balance give them a quality flake or pellet food as the base to the diet. Supplement this with live foods such as white worms, blood worms, brine shrimp, or any other suitable substitute. Vegetable tablets can be offered as well. Generally feed once or twice a day. These gouramis are hardy fish. Although the labyrinth organ allows the fish to survive in oxygen depleted water, it is a common misconception that this makes water changes unnecessary. This is hardly the case as these fish will suffer the same tissue damage from built up toxins as any other fish. Regular water changes are a must with 25% weekly being recommended. 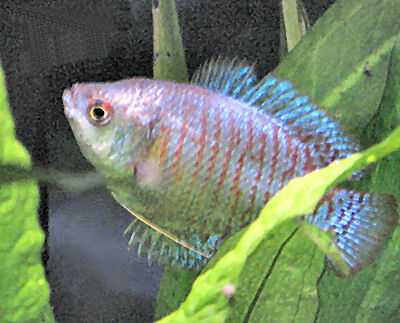 The Dwarf Gourami will swim in all parts of the tank, but especially likes the middle and top portions of the aquarium. As a small fish they can be housed in smaller aquariums. A single fish will need at least a 5 gallon tank, but a larger 10 gallon aquarium is recommended. A larger tank has plenty of space for plants and the water will be more stable, and there will be room for some tankmates as well. It is desirable to keep the tank in a room with a temperature as close as possible to the tank water, or risk damaging the labyrinth organ.The tank should have an efficient filtration system but should not to create too much of a current. Air stones are also recommended for these fish as they prefer well oxygenated waters. Dwarf Gouramis will show their colors best on a dark substrate. They enjoy an aquarium that gets a good amount of light, but the tank should be decorated in a manner that provides plenty of hiding places for retreat. If the tank is too sparsely decorated tank they will become shy and withdrawn. These fish appreciate dense vegetation with some floating plants to give some cover. However they will regularly breath air at the surface so its important to have some areas unencumbered with plants. The tank needs to be located in a quiet area as these fish are easily scared by loud noises. Dwarf Gouramis are a good community fish that can be kept with other peaceful fish. Large, active, or aggressive fish can easily intimidate them.They can be timid and may hide when first introduced to an aquarium. It may take some time for them to become comfortable and behave normally. Although this fish is often sold as pairs, the male may become belligerent to the female. Sometimes a pair can be kept together, but watch for male bullying of the female and provide plenty of hiding places.. Two males, similar to bettas will fight, especially in smaller aquariums. Unless the aquarium is very large and well planted it's best not to keep a mix of Gourami species together or to keep this fish with other anabantoids including Bettas. These types of fish will bring out the aggressive side of this gourami. Avoid housing them with fin nippers and brightly colored species like guppies. Same species - conspecifics: Yes - It is generally not a good idea to keep Dwarf Gouramis together unless breeding or in a very large tank that is heavily planted. Peaceful fish (): Safe - They do well with other small peaceful fish. The male is much more colorful and has a pointed dorsal pennant, they also generally have a smaller belly than the female. The female actually has very little color at all, and her dorsal fin is rounded or curved. Pairs will generally swim together. Breeding the Dwarf Gourami is not too difficult, but the behavior of the males can be somewhat unpredictable. It is best to provide a breeding tank, either a 10 or 20 gallons works fine, and keep the water level low at about 6 - 8" (15 - 20 cm). Normal water parameters are fine but raise the temperature to between 80 - 84° F (26 - 29° C). Add a small gently air-powered sponge filter or some peat filtration. They need several fine leaved plants, like Hornwort or Milfoil, along with some floating plants like Ricca for comfort. Sometimes during the courtship and after building the nest, a male may consider females to be rivals and bully them. So the plants are essential for the female to have places for retreat. A male and one or more females need be well conditioned with small offerings of live and frozen foods several times a day. When well fed, females should begin filling out with eggs, appearing very plump. Add one or more females to the breeding tank several days before the male, preferably in the dark, and continue feeding conditioning foods. Then add the male. Like many fish in this family, male Dwarf Gouramis are bubble nest builders. They do go a little farther in their nest building than most gouramis however, and will weave in bits of plants and debris into their nest structure. In nature they add such things as leaves, twigs, roots, peat fibers, and other debris. In an aquarium you will see a cluster of bubbles on the top of the water. Once the nest had been built the male will begin a courtship display, usually in the afternoon or evening. He will flare up his dorsal fin and begin swimming around a female trying to draw her underneath his nest. If the female is willing she will begin circling with the male. To spawn she will touch the male with her mouth, either on the back or on the tail. The male then embraces the female, ultimately turning her on her back and the female will release about 5 dozen clear eggs. Once the female lays the eggs the male will immediately fertilize them. The eggs are lighter than water and float to the top. The male will pick any that did not make it to the nest in his mouth, and then put them in his bubble nest. The pair will then spawn again until anywhere from 300 to 800 eggs are produced. If there are other females, the male may spawn with them all. After spawning remove the females, as the male will become totally intolerant. He will continue to tend the nest and guard the eggs until they hatch. The eggs will hatch in about 12 - 36 hours, depending on the temperature, but the fry will stay in the bubble nest and continue developing. They will be free swimming and leaving the nest in about 3 days. At this time the male should be removed as he may eat the young. Free swimming fry can be fed infusoria or a liquid fry food until they are large enough to eat baby brine shrimp. Separate rearing tanks will be needed as the fry vary in size, and bullying is common in these small environments. See the description of breeding in: Breeding Freshwater Fish: Anabantoids. Also see Fish Food for Fry for information about types of foods for raising the young. Dwarf Gouramis are very hardy so disease is not usually a problem in a well maintained aquarium. Some diseases they are prone to are bacterial infections, constipation and Hole in the Head if good water quality, nutrition, and maintenance is not provided. With any additions to a tank such as new fish, plants, substrates, and decorations there is a risk of introducing disease. It's advisable to properly clean or quarantine anything that you want add to an established tank prior to introduction, so as not to upset the balance. In recent years some available specimens have been found to carry a virus called the Dwarf Gourami Iridovirus (DGIV). Symptoms include lethargic behavior, darkening of color, and tumors, and infected fish will die within a year. Currently there is no treatment for this virus and it can be transmitted to some other fish species sharing the same water including Swordtails, Mollies, and possibly cichlids. This is a new development thought to be the result of mass-breeding for the hobby which may have resulted in a widespread epidemic. Previously similar illnesses with these fish pointed to bacterial infections such as fish Tuberculosis and Nocardia-type bacterial afflictions, but more recently it is thought to be this disease. In 2006 a study conducted in Australia in dictated that as many as 22% of the specimens coming out of Singapore were carrying the disease. The Dwarf Gourami is readily available both in stores and online and is moderately priced. I have a Dwarf Gourami pair. The male will chase the female a bit but otherwise they are fine together. The male is definently quite the show, he chases everything that passes the tank and attacks me when I clean it. He spits water at me when he builds a bubble nest and has jumped out of the tank on to the floor trying to get me! He is one lively little fella. I have a ten gallon aquarium with one Neon Tetra and three Julii Cories. I want to have schools of them, but then my tank would be overstocked. I am doing the one of fish per square inch of surface area, as is suggested on this site. I would also like to have a Dwarf Gourami in the tank as well. Would it be too overstocked, or should I just have the Neon Tetras and Julii Cories? The 'one inch of fish per each gallon of water' is a good rule of thumb, but is just that... a rule of thumb. A number of other factors can also play, like how often you do partial water changes and what's the activity level of the fish. Well established tanks can sometimes also be more crowded. So it's a good place to start but then you have to learn about your fish, your tank, and your maintenance practices. The neons are very small (not even an inch) and so a Dwarf Gourami (closer to 2 inches) may work fine. Then watch and adjust the tank/decor/companions as needed. We have a striped orange dwarf and two blue dwarfs in our tank, the blue ones are tiny and really funny to watch. The orange one is bigger and can be quite aggressive to the opaline gourami we have, but gets along fine with all the other fish in the tank (corys, plecs, barbs). They seem to have a lot of personality and definite facial features! When i started with my tank i first got 2-3 mollies, guppies, neon tetras, one algie eater and one male dwarf gourami. When i put my fish in the tank i observed my gourami for a couple of days and it was hiding in the corner all the time, so i told my parents about whats hapening with my gourami. One day i came back from school and i noticed a another gourami in the tank, from then on it seemed that everything was fine. But later that evening i noticed my guppy missing a chunk of a tail ,the gouramis attacked the weaker fish in the tank. I realised it was a male pair so i desided to give back the pair to the pet store. More than 2 years later i decided that i want another pair but a male and a female. Am i going to have the same problem please help !!!! It's hard to say what will happen. Check out the Social Behaviors section on this page, it has some ideas about tankmates and aggression.